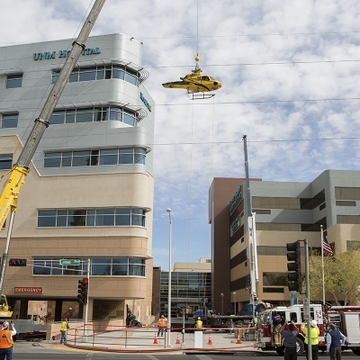 A disabled PHI Air Medical helicopter is safely on the ground, after a crane lifted it from the roof of UNM Hospital Saturday. The helicopter had been there since Wednesday, when it crashed while attempting to take off. Police blocked off a section of Lomas Blvd. before dawn Saturday, and shortly after, crews positioned the 125-ton crane in front of the hospital's entrance. By 10:15 a.m., the helicopter was on a flatbed truck, and electricity - which had been provided by generators during the operation - was again coming from the power grid. 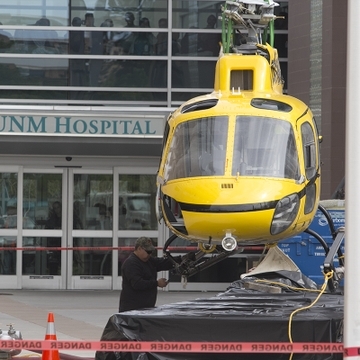 The complex operation was coordinated by UNMH and UNM emergency managers, who worked with law enforcement, the Albuquerque Fire Department, PNM and PHI Air Medical - the helicopter's owner - on a detailed plan to get the chopper down safely, with as little disruption to patient care and university operations as possible. UNMH and UNM had activated their emergency operations centers (EOC) to develop and carry out the removal plan. "The emergency operations center did exactly what it's supposed to do," said Dr. Bob Bailey, a UNMH physician and one of the EOC incident commanders. "Patients and staff are safe, and the integrity of our clinical operation was preserved. What a privilege to work with such dedicated people, who rose to the challenge and performed superbly." Before bringing the main body of the helicopter down, the crane lowered the aircraft's tail and two 55-gallon drums of fuel that had been offloaded from the helicopter Friday. 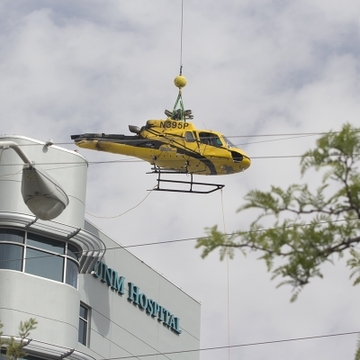 Due to high-voltage power lines running next to the hospital, PNM required that power be cut to those lines while the crane lowered the wreckage. During the removal, UNM’s Physical Plant Department switched to internal power at the university’s Ford Utilities Center. UNMH and other critical facilities on campus relied on generator back-up. Clinical services at the hospital continued uninterrupted, while the switchover caused some intermittent power outages on main campus. Because of the removal operation and power switchover, UNM had cancelled classes and indoor events scheduled before noon on Saturday. 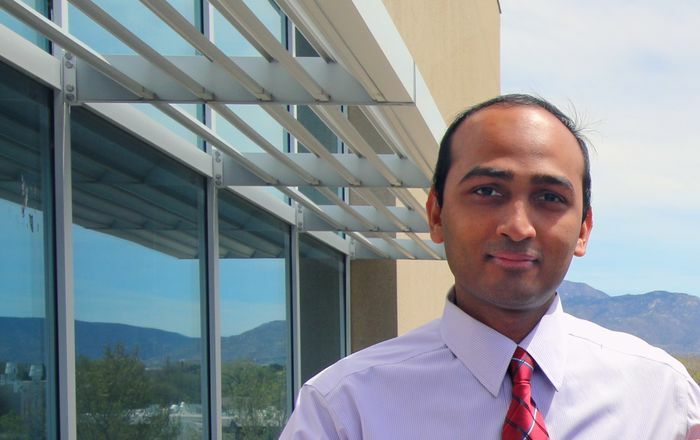 The adjacent UNM Health Sciences Center had also cancelled campus activities Saturday. The National Transportation Safety Board now has possesion of the helicopter as the agency continues its investigation into what caused the crash. The helicopter spun around several times before landing on its side near the edge of the roof, after it attempted to take off from the hospital's helipad. There was no patient on board. The pilot suffered minor injuries and two other crew members on board were not injured. There were no injuries to UNMH patients or employees. 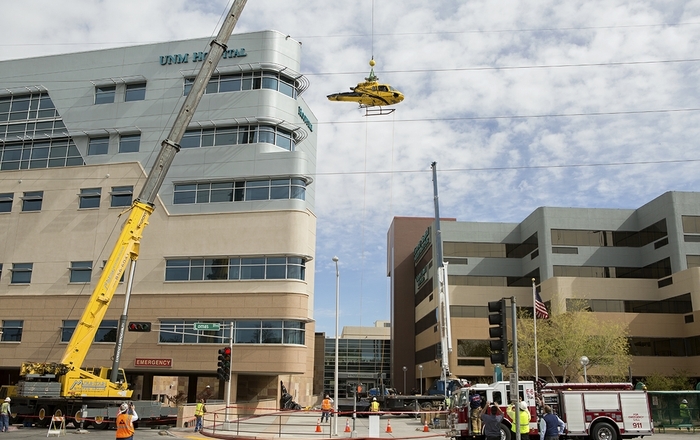 As a precaution, 18 patients on portions of UNMH's fifth and sixth floors directly beneath the helipad were moved to other areas of the hospital. Otherwise, patient care was uninterrupted. Most clinical and administrative hospital operations are back to normal.